Haha, oh man, I've been sitting on this recipe for such a long time! I'm not really sure how that happened ;). 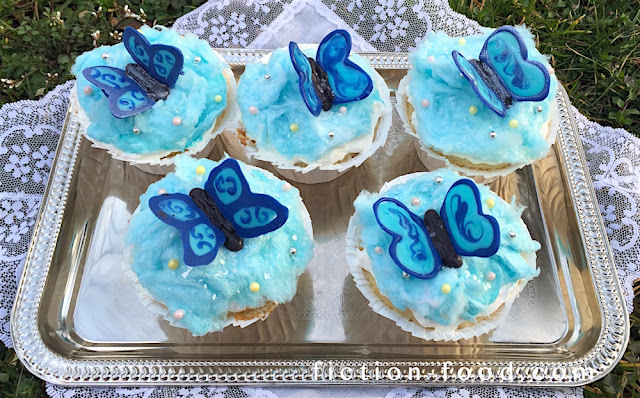 These cupcakes are inspired by Disney's live-action "Cinderella" which was in theaters this time last year. It's Spring once again, so it's a good time to finally share them! Carrie and I did a Fiction Kitchen Podcast episode in-which we discuss the 2015 film along with several other iterations of the fairy tale (you can listen to the episode here), and I made a few inspired foods including little pumpkin pot pies, tea-time picnic sandwiches, a scene-inspired teacup mouse table, and these decorated cupcakes to go along with the blue butterfly motif that pervades the film and the puffy clouds from the very beginning of the movie with baby Ella and her mom (Hayley Atwell!). Both the butterflies and the clouds Ella's little baby hands point at represent her innocence and wonder which never leave her even after the hard experiences she goes through as she grows up. 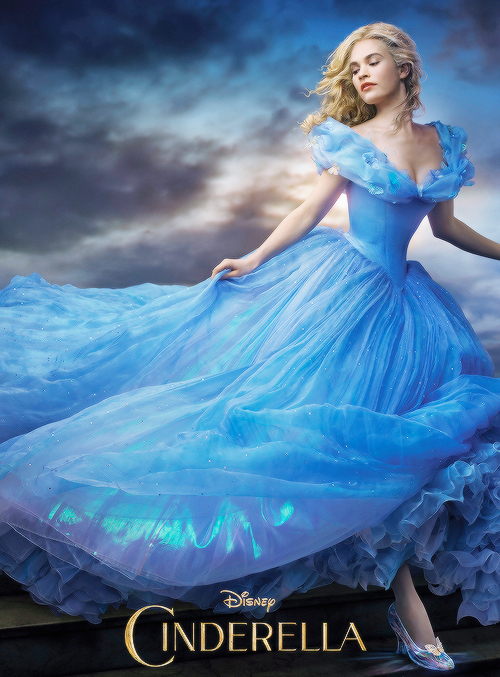 The butterflies in particular make several appearances in the film and symbolize the subtle magic (seeming and real) that flows throughout Ella's story. "When there is kindness, there is goodness. When there is goodness, there is magic." Note: Rather than a straight-up recipe, this is more of a how-to for decorating the cupcakes. I simply used a white cake mix for the cupcakes, but if you have a go-to cupcake recipe, use that! Same goes for the buttercream frosting, you can homemake it or use store-bought (you can find a basic recipe here). Mix up the pudding & chill it according to the package instructions. Fold in the whipped cream until fully combined & fluffy. Put in the fridge until ready to use. Make the cupcakes, in white liners, according to the back of the cake mix box. Let cool completely & then carefully cut out the centers, about the diameter of a quarter, making sure you don't go all the way through to the bottom. Set aside until needed (eat the insides you cut out though!). Make the vanilla frosting if you're not using store-bought. Line a large tray with parchment paper. Melt the black candy melts in a microwave safe bowl in increments of 30 second or less, stirring after each heating, until fully melted (stir in the dipping aid if you're using it). Spoon the melt into a candy decorating bag or squeeze bottle & pipe several line segments about 1/4" wide x 1 1/2" long onto the parchment paper, as many as you have cupcakes. These will be the butterfly bodies. Let sit to harden. Repeat the melting process with the dark blue & the light blue melts. With the dark blue pipe a "ᗺ" shape & a "ᗷ" shape for each cupcake (you can make them pointier if you like as I did for some of mine). These will be the outline for the butterfly wings. 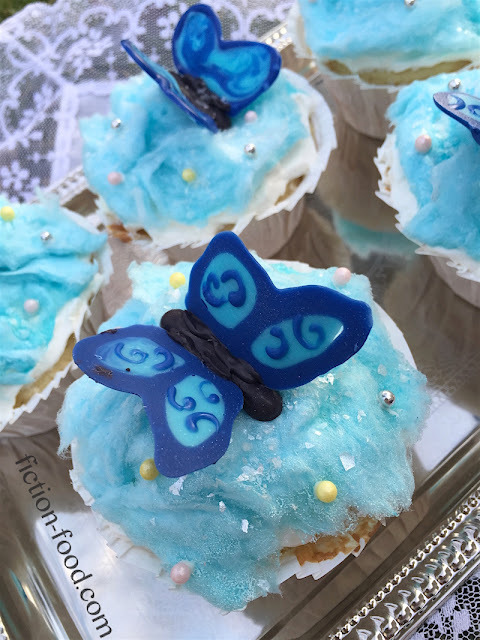 Pipe a thin layer of light blue on top of each wing outline & then swirl in a little dark blue using a toothpick (you can see in the pictures that I tried different ways of decorating the wings but I like the toothpick swirl of dark blue in the light blue best. You can totally use the toothpick to draw a curly pattern onto the light blue after it solidifies a bit if you'd like though!). Let the pieces harden completely & then gently peel them from the paper & have at the ready. Fill a plastic sandwich bag or larger with the chilled pudding/whip mixture & snip a hole in one corner. Pipe the mixture into the centers of the cupcakes. Fill another plastic baggie with frosting & pipe a thin layer on top of each cupcake (or you can simply spread it on with a butter knife). 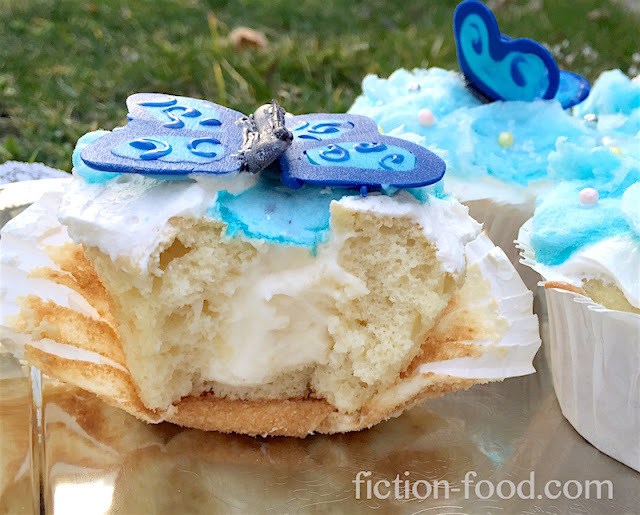 Place enough blue cotton candy on top of each cupcake to cover the frosting. Using tiny dots of candy melt, secure one black candy melt body each onto the top of the cupcakes. Place 1 toothpick on either side of each black melt segment (so 2 toothpicks per cupcake) at a 45º angle. One at a time, pipe a thin line of black melt on the sides of the black segments & quickly place a blue wing on either side, the straight edges in the candy melt you just piped, tilted up by the toothpicks. Let harden in place & then carefully remove the toothpicks. Decorate the cupcakes with little pearl sprinkles by attaching them here & there with a speck of candy melt on a toothpick. Eat the cupcakes soon because gradually the moisture of the cupcake will melt the cotton candy! Hmm Wow Blog Post.Divine Bakery store provides delicious, moist, Gluten free baking mix; Bake at home Preservative, Celiac disease free and pure quality ingredients products.